I am sure the bank would apreciate this. I mean, look at it. It looks adorable. If I was Coleasquids banker I would totaly aprove her loans after seing this. And there’s my MASSIVE INTERNET DICKERY Award achieved for the day. I don’t think we have met the same bankers then. Now if you exuse me I must go and collect my award for being too lazy to spellcheck. Yeah uhhhh the proper grammar here would actually be “reward”, not “award”. Reminds me of this webcomic set in the future where you submit funny cat pictures to the bank to make deposits. Okay, now I want to draw fanart of a pink raptor cosplaying Lucy Lawless. And that was how Jurassic Park started. She is very scary. I am scared. And definitely do not want to cuddle her. So scared. A t-shirt with the kanji in the following link, because comments don’t seem to like Unicode. Gah, this makes me smile so hard. Gotta love fonts where, “r”, and “n”, together looks like, “m”. Hello bank, I’d like to deposit a art. OMG that is so cute. I want to kiss it. Yes, you are a very scary raptor and I am very scared of you and your cute butterfly there. Ohh, it should be wanderfull tshirt image. Wow, i cant even think about it. Awsome. This is amazing. Best warrior princess. Why am I thinking of Big Hero 6? Hell of a security feature for anti theft: your password is to draw this. Am I the only one that imagines the Godzilla roar when I look at this? Doesn’t an armada have to be on boats? ….fluffy raptors in pirate hats? that would be pretty rad. I hope your bank appreciated the cool picture you sent them. princess no! think of the butterfly effect! D: you dont know what time or dimension that thing came from! With the wings up like that, I can’t help but picture the Crane Kick from Karate Kid. Even if the feet are in the completely wrong position. [Classic Batman Starbursts] FLAP! SCRATCH! WOK-WOK! Please make this a t-shirt. 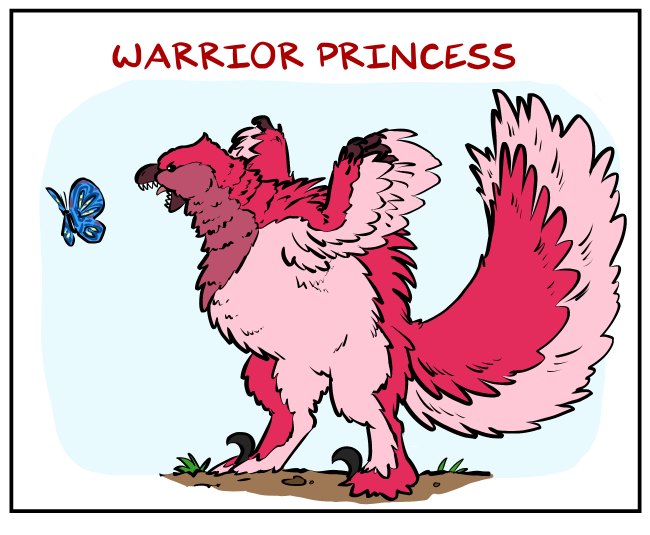 :’1 I want a fluffy warrior princess. Put a stock collar and a monocle on her and submit it to The New Yorker Magazine.